You steamed the radishes?? I don’t think you’re supposed to cook radishes at all. They’re like… well, celery, I guess… something I’ve always thought were added to a salad and eaten raw. Try them that way, as sort of a salad condiment. You might like ’em better. Yeah, I steamed them. It was the second recipe on my radish search at allrecipes.com. Haven’t had any parsnips, since I was a kid. I’ll have to try one. I never heard of cooking a radish. Love them sliced in salads. I also stick several in a baggie to take to work a few times a week. Mmm, fish. I just trim them and eat them plain. I love radishes! It might be an acquired taste, though, if you haven’t tried them before. Not sure how parsnips compare to potatoes on the glycemic index, but whipped parsnips are a nice change from mashed potatoes. I hate fish. I refuse to eat fish. Because it all tastes the same–like fish. Blech! As for the vegetables, I’m really only willing to eat maybe 8-10 varieties, and outside of that, nothin’ doin’. The weird vegetables aren’t popular because they’re not very good! ;) But good on ya for being an equal opportunity vegetable eater. I’m an equal opportunity snack cake eater, but I don’t think that counts. I too have never heard of cooking radishes! I always just eat them on salad raw. I guess you learn something everyday. When you say you roast your veggies are you roasting them in the oven, on a grill or on your foreman grill? And when you say you eat them for snacks are you saying you roast them and snack on them all day? I mean do you eat them cold? Or are you roasting them everytime you want a snack? Hmmm… Cooked radishes? I always thought they were for eating raw or for cutting up raw in salads–for the crunch, the color, and the slightly peppery/astringent taste. Tilapia is my favorite fish to eat every since I was a kid and my family would go to the local fish farm. The farm raised the fish and you could buy them fresh. My dad would de-scale and fillet them at home. Now, I have to live with frozen tilapia, but it’s still good. Will you allow me to be the resident cooking expert on your blog? (Not that I’m really an expert, but I do read a lot!) Radishes are often cooked, as well as eaten raw. In Chinese cooking, the white radish known as Daikon is used a lot in stir-fry dishes. I’m on a bit of a radish binge lately but I have eaten them most simply raw, sliced in half, dipped into homemade ranch dressing. One of my favorite recipes though is a salad I created with raw broccoli, radishes, and blue cheese dressing. Just fantastic. If you like blue cheese I recommend it highly. Parsnips are really good diced and added to soups – they’ll help thicken it without really adding calories. If you’re pureeing a soup, they’ll also help add body to the soup. I’m not crazy about them solo, but rely on them for stews and such. They’re also a nice addition if you’re roasting up a whole mess of vegetables. I’ve never eaten parsnips on their own, but they add a lot of flavor to soups. Whenever I make vegetable stock I always throw one in! I can honestly say I have never had a parsnip but I will try it now. I have heard they are like a cross between a carrot and a potato. I have never liked the radish unless it was chopped up so small in a salad I couldn’t taste it. You know what I have discovered recently that I like…BEETS…so you may want to try those next if you haven’t already. Yum. 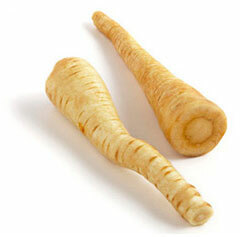 I love parsnips, and they do add a special ‘something’ to soups. But be aware that they are really delicate and they don’t keep all that long in the fridge (unlike carrots that can go weeks) so don’t buy ’em in bulk! mrs darling – I’ve recently starting roasting broccoli and cauliflower in the oven, which is also the way I did the parsnip. I grilled some eggplant on the George Foreman grill and that turned out pretty well, though I forgot to spray cooking oil on there first and it got sticky. I usually eat them as snacks in the evening, but that’s mostly because I cook them at night and then eat them as an after dinner snack. I *could* bring them to work to snack on if I thought that far ahead, but I usually just grab a fruit instead. I do prefer roasted veggies hot, but honestly I’m always going to prefer fruit to veggies. It’s just how my tastebuds are wired. you’re not weird! you’re a bold pioneer! i’ve seen people do a lot weirder things with vegetables. Yes, I latch onto random things. dg – Mmmm, roasted carrots do sound good. I’ll have to try those. ammo – OMG, I had heard that song before but never seen the video! I find it bizarre that someone else came up with the idea of a fish head garden before I did. Roasted parsnips are quite tradional over here in the UK, especially at Christmas or with Sunday dinner, just roast them up the way you would a potato. A fish I’ve really started to enjoy recently is trout. the flesh looks very similar to salmon but the taste is nowhere near as strong. I tend to out a little piri piri rub on it and pan fry quickly with a little spray of oil, really really nice! Parsnips below to the cows, radishes… yep you are a dork, and I totally agree about fish, most of it tastes the same. Have a wonderful weekend chick. Roasted vegies…ymmm… you’ve inspired me. By the way…a GREAT recipe (in my opinion, that is) is a low carb wrap with hummus and thinly sliced roasted vegies. Eat it at room temp so that the vegies and hummus can work togeter in terms of flavor. It is really satisfying. I tend to forget to roast vegies…but they really aren’t a big deal, are they? Pop them in and let the oven do the work. thanks for the reminder! ahhhhhh, ammo beat me to it! the ol’ fish-heads video! There are TOTALLY gardens full of fish my dear! Maybe not in YOUR neighbourhood but….. you could be the first to start one! I think you should try the radishes again – I find that they are very variable, sometimes bitter and sometimes delicious and almost sweet. I don’t know what to look for in a radish, it’s always been hit-or-miss, but definitely give them another chance. Girl, here’s what you do for a delicious taste explosion. Boil up some peeling parsnips and carrots. Drain and mash them. Add butter spray. Prepare to have your mind blown by deliciousness. Oops that is: peel THEM. Peel the parsnip the same way you do the carrot. And then mash them up together like they were mashed potatoes. Add butter spray and salt. BTW, i remember your turnip kick of a few weeks back. W/ a turnip, you peel it with a knife to get the waxy skin off. Then you slice it into chunks. Then you boil the chunks, drain and mash with salt, pepper and butter spray. It’s an acquired taste, but it is really yum. 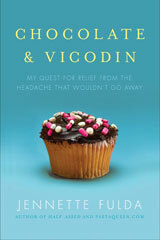 Can you recomend a gook book re: glycemic index or glycemic load information?? P.S…Has your brother returned the camera? I can’t wait to see the new pictures! As for cold roast veggies, nothing beast a cold roast potato. Can’t get enough of it. Especially mashed onto a cold roast pork sandwich. With gravy. I was eating radishes as I read your denouncement of them. Ack! 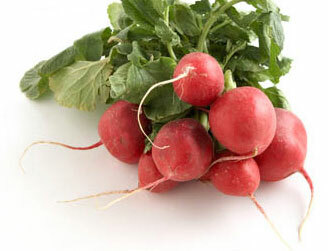 Spring radishes are fabulous because they are mild. I went through a pack of french breakfast radishes last week, and then this week used a pack of easter egg radishes. What I did, a riff off of a recipe from chocolate and zuchinni, was to slice the radishes thin on a mandoline, and lay them on a plate. Sprinkle with sea salt. put a small chunk of avocado on top. That was fabulous, I had stopped eating avocado on a low-fat kick and was suprised by that taste combination: the avocado being mild and smooth, the crunchy-bitter radish offset it beautifully. Though I’ve also been shocked at how much I love sea salt. The easter egg radishes are a range of colors (white, red, purple), and it felt fancy to eat them canape-style without bread. Oh, I did the french breakfast radishes with a dab of goat cheese. if you lived near the ocean you’d have a more vast array of fish to try. salmon, tuna (real tuna, i mean), haddock…they’re all different. your basic white fish, particularly farm raised, isn’t going to taste like anything because it’s being fed monotonous grain. like a cow. free range fish eat a variety of things and that changes their texture, color and flavor. and lots of people use fishheads in their gardens, it’s good compost for your plants. You could eat radishes like my mom used to: on white bread with butter! She grew up in the Depression so they ate what they grew and apparently, they always had radishes around! Keep up the good work! You are really an inspiration!!!! How hot and for how long do you roast all this stuff? I ended up with broccoli crisps. The taste of fresh tuna, esp. grilled, is worlds away from tuna in a can. Wowza. It is strong, though. Kind of steak-y texture. Don’t know if you like sushi or not, but experimenting with sushi would be a great way to experience the flavors of different fish, in their highest quality, purest form, in a way that best contrasts their subtle flavor differences. A rainbow roll (which usually has salmon, tuna and cod at least) may be the best bet. You would have to go to a good sushi restaraunt, though. Wouldn’t want to try it at one of those fast-foodish type sushi places. As a product of the Gulf Coast, I have to recommend grouper and red snapper, if you can get it. Sea bass is good, too–but it’s EXPENSIVE. christine – I haven’t read any books just about the glycemic index, but I’m sure if you hit the diet section of the bookstore or library you can find one. I found most of my info online. And sadly no, my brother has not yet returned the camera. I promise I will get it back one way or another next week. beula – I roast at 400 degrees F for 10 minutes, then I pull them out and stir them and go for another 10 minutes. With cauliflower you look for it to start turning a golden brown color. Times and temps may vary according to your oven. At my old apartment I had an oven that cooked very quickly because it was so small. I only will tolerate a few radishes if they are thinly sliced on my salad. They are too hot for me to eat by themselves. I do admire your produce adventures. It took me a long time to stop thinking everything but carrots and celery were “yuckky” like a little kid. I enjoy reading your blog, love your sense of humor! I’m new here, but I had to let you know I love this series! I tried parsnips this winter for the first time and was pleasantly surprised. I’ll be back to read more! Slice the radishes very thin and soak the slices in ice water, then dry. The slices make a zippy, healthy “chip” to scoop up hummus! You have been tagged for a “Thinking Blogger Award”. Check out my blog if you would like to participate. P.S. I saw some parsnips in the grocery store today and smiled to myself because of this post. Love that your so adventurous. Glad everybody straightened you out about the radii (pl?). Yikes – I can’t imagine ’em steamed but I do occasionally enjoy them in a salad. I LOVE seafood – mmm mmm mmm! The sea’s vittles are tasty! I especially love shrimp. They can be prepared so many ways and they cook so quickly. Mmm parnips. I discovered them too after I began eating healthier and went vegetarian and decided to try some of the odder vegetables my parents never fed me as a kid. I’m lazy though, and nuke them for a couple minutes and slather them with the zero-calorie spray butter. A tasty dinner. try this way of eating radishes: cut them up into little pieces and mix them into light cottage cheese with some pepper and salt – the cottage cheese counters the spiciness of the radishes, and they add a nice crunch. it’s one of my favorite snacks of all time! 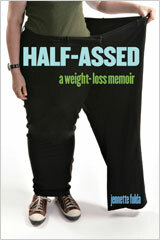 btw – you look terrific in your 180lb picture! so inspirational! try rubbing the fish fillet with a slice of garlic, it really gets rid of the fishy taste. also rubbing it with lemon juice works too. (all of this prior to cooking). give it a try, i’m a fish fanatic, i eat a kilo per week, so about 5 meals. it’s my way of fighting carbs. i really, really must cook something absolutely wonderful, flavorful, and filling in order to avoid carbs, cause i settle for sandwiches and pasta way too easily. James Beard had a recipe for cooked celery as a side dish so I can believe cooked radishes. Have you tried Jicama? Becareful, it’s a tasty rock. You can eat it raw in slices or shredded in salad. I fried some once but they take forEVER to brown and it’s actually better raw.